First of all, I want to say a very big “Thank you” to everyone who has already sent in a donation to help fund our web site. In one week, we have already raised $1750, which is almost enough to pay for all of the basic upkeep on this site for our current fiscal year (April 2013 to March 2014)! This is a very encouraging start. Please pass the word to anyone else you know who enjoys this site and may want to give us some financial support. 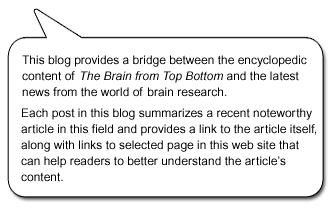 Well, the on-line donation system to let our readers help fund The Brain from Top to Bottom is now up and running. To learn more about why we have turned to you to help meet our budget, and how you can make a donation, please read the column to the right. As you can read in the column to the right, after having sponsored us for more than 10 years, the CIHR Institute of Neurosciences, Mental Health and Addiction has been forced by budget cuts to cease our funding as of March 31, 2013. We were given the news in August 2012, and ever since our little team has been looking for another source of stable funding to let us continue our mission of providing the general public with the best possible information about the brain and neuroscience.